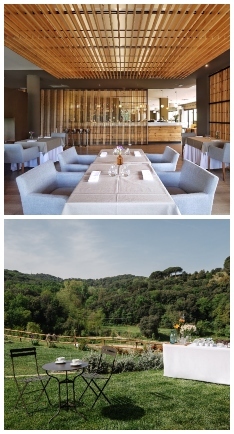 Mas Salagros is located in the nature reserve of Vallromanes, just 25km from Barcelona and 35 minutes from the airport. The project was created respecting the highest standards of sustainability and complying with all European regulations on organic issues. In this regard, high Mediterranean gastronomy is one of their strengths. Furthermore, according to their philosophy of well-being, Mas Salagros has Roman thermal baths, in collaboration with the international firm AIRE ANCIENT BATHS. For MICE groups, the hotel offers 6 rooms for all type of events, from meetings, presentations, conferences, workshops, cocktail or gala dinner. The surface of the complex has a total of 5 hectares. Currently, the Resort has 60 bedrooms. To ensure the well-being of its guests, Mas Salagros has 3 restaurants, 2 outdoor swimming pools, a gym, and the Roman thermal baths AIRE. The gastronomic offer of the EcoResort is based on high Mediterranean gastronomy made with 100% organic and proximity products. Part of them comes from their own Salagros Farm and vegetable garden, where they grow and produce fresh and seasonal products. The menu varies according to each season. Upon the previous request, the restaurants have menus and special diets such as vegan, celiac or a special menu for sportspeople, among others.